Enjoy Utah! : Two Days Left To Vote! 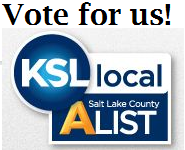 If you have not yet voted in the KSL City Voter, please do so now! There are only two more days to vote, and they have hid our stats from us! Follow the links below to vote for us and other businesses we love!